As much of the nation, or at least the nation’s media, focused on the ten-year anniversary of 9/11, I primarily focused my weekend TV-watching on US Open Tennis played here in New York City, specifically Flushing Meadows, Queens. The women’s final between three-time US Open champion, Serena Williams and Samantha Stosur, the 27-year-old underdog from Australia who had yet to win a women’s singles Grand Slam tournament (as opposed to Serena’s thirteen singles titles), was played Sunday afternoon. I like both players very much. Serena, who turns 30 in a few weeks, and was ranked a very deceiving 28, has made a remarkable comeback from a lacerated foot injury suffered in June 2010, and this past February she was hospitalized with a very scary sounding blood clot in her lung. Couple her physical ills with her sister, Venus, having to withdraw from this tournament after being diagnosed with an autoimmune disease, Sjögren’s syndrome, Serena won a double dose of sympathy points from me by default. Yet, my close pal, Milton, who is still in a recovery of his own from Novak Djokovic defeating Roger Federer in a heartbreaking men’s five set semi-final has loathed Serena for years. What he loathes most is her personality. He thinks she’s a jerk and it infuriates him when people assume that Venus, who is always gracious, is the same way. 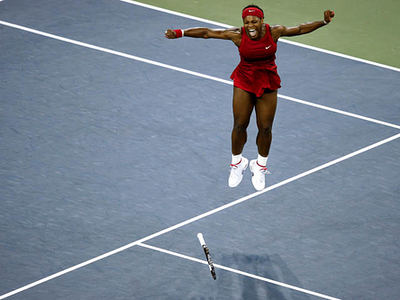 When Serena last won the Open in 2008, as she was exuberantly jumping up and down, Milton called. Thrill of victory Serena-style on September 7, 2008. 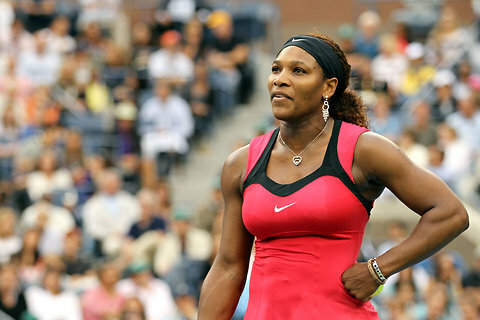 The following year, 2009, during the second set of the Open’s women’s semi-final against Kim Clijsters, Serena displayed one of her notorious fits of bad temper. She was already down a set, and the second set score was 5-6. Serena was serving to stay in the match at 15-30. Then, the lineswoman called her on a foot fault twice and the score was now 15-40; Clijsters had two match points. Enraged, Serena profanely threatened to shove a tennis ball down that lineswoman’s throat. This display of ugly antics awarded me another Milton phone call. Milton: Do you believe this? She deserves to lose! Just as he said that, she was smacked with a one-point penalty for unsportsmanlike conduct. The victory went to a baffled Clijsters. Fast forward to the present. Throughout the entire 2011 US Open Serena has been the model of poise and power dominating opponent after opponent. She had not dropped a set in her entire comeback run leading to the final. Prior to the start of the match, Serena the Magnanimous announced that she was playing for her country in honor of 9/11. I had been feeling neutral over who should win. I’ve always had a soft (or maybe it’s a wet) spot for scrappy underdog Stosur, who has a powerful serve and a wicked forehand. Her matches, all brilliantly played (including a riveting 32-point tiebreaker against Maria Kirilenko), received second billing. None of her matches leading to the final rated network TV coverage. Only snippets of her semi-final were broadcast live since her match conflicted with the men’s semi-final where Rafael Nadal defeated Andy Murray. Milton can recognize Stosur’s athleticism but he has issues with her highly toned arms; arms that make me drool. Milton insists that they look like a man’s. 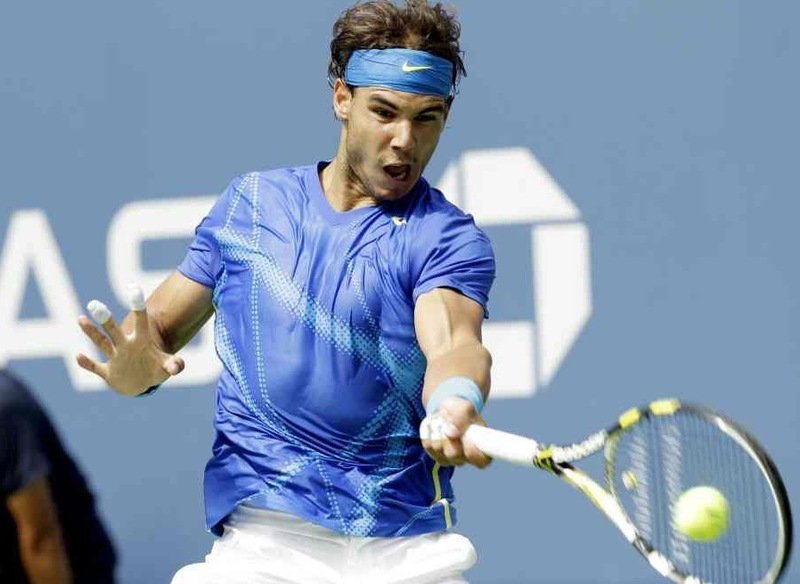 Milton: They make Rafa’s look wimpy. Stosur had all the momentum, but when Serena was facing break point on her serve in the first game of the second set, she flubbed. She hit an obvious forehand winner but made the relatively innocent mistake of shouting at the ball, “Come on!” Everyone knew why she had shouted at the ball. She’s an aggressive competitor and was feeling frustrated with her game, which was sluggish. I felt bad for Stosur was actually making mincemeat out of her. Yet, according to an arcane rule, a player is not supposed to scream before the opponent makes contact with the ball. The chair umpire, Eva Asderaki, correctly called the error on Serena and that gave Stosur both the point and the break. Serena: Because you’re out of control, you’re out of control. You’re not only out of control, you’re a hater, and you’re just unattractive inside. Who would do such a thing? And I never complain! Wow. My full allegiance instantly shifted to Stosur as soon as Serena declared, “And I never complain!” I am sure that gaining my positive vibes was all Sam needed to regain her focus and convincingly defeat Serena in two sets 6-2, 6-3. Samantha Stosur's thrill of victory moment. 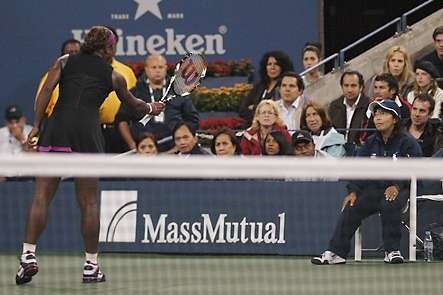 After her loss, in another display of no class, Serena refused to shake Asderaki’s hand. Milton did not call, a sign that he resisted tuning in. I considered calling him, but I thought better of it not wanting to raise his blood pressure. If Serena was truly intent on being a sports hero and honoring her country with a victory on the tenth anniversary of 9/11, she should have suppressed her inner jerk, shut her pie-hole and played her guts out. This entry was posted in Humor and tagged samantha stosur, serena williams, tennis, unsportsmanlike conduct, us open tennis, women's final. Bookmark the permalink. Amen about Serena. Me? I’m one of the “lame” many who posted about 9/11 yesterday. Silly, sappy me! Wish I’d thought to write about tennis. 9/11 is impossible to joke about, and I was here in NYC working a soul-sucking job in broadcast news when it happened. In many ways that epic nightmare was the catalyst for this current phase in my predominantly misspent life and for my indulging in writing these mindless Lame Adventures! Thanks for checking in Kathy. Like you, I’m a huge tennis fan, and I was completely disappointed with Serena’s behavior. Someone’s gotta tell her to grow up and learn to shuttie her yap-yap. Love your blog, by the way! She completely lost me when she blew her stack, same old hot-head Serena! Thanks for checking out LA. I’m at work and at the moment in my boss’s good graces, so I can’t look at your blog as closely as I’d like to, but from what I’ve glimpsed, it looks hilarious — but I might also need to pop an Aleve now! Serena should have def. toned down her ego if she was going to talk about playing in honor of 9/11. Who is Samantha Stosur and where has she been all my life?! Yeah, Serena behaved like a jerk again. It’s so tiresome. I wish she’d start popping grow-up pills before she exits the sport. Stosur crossed my radar last year and I thought the EXACT same thing! Definitely someone very special from Down Under. I’m just throw this is to get the ball rolling: Stosur’s definitely on the juice. Good thing she doesn’t play pro baseball or ride in the Tour de France. I can see why you would think that, but she’s looked like Thor forever and I imagine that she must be the poster child for juice-head testing. Also, look at Serena and think about her serve. If one of her aces hit anyone, including a knight in shining armor, they’d be sliced in half. Maybe I’m naive because I love this sport, but I don’t think that she’s women’s tennis Barry Bonds. I think tennis is, again I might sound like I’m living in Fantasyland, clean. ..I mean “I’m just gonna throw this in..” darn it.